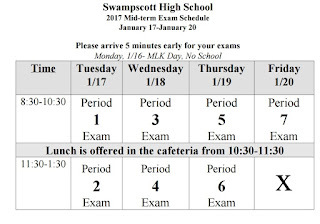 Next week at Swampscott High School is Midterm Exams. 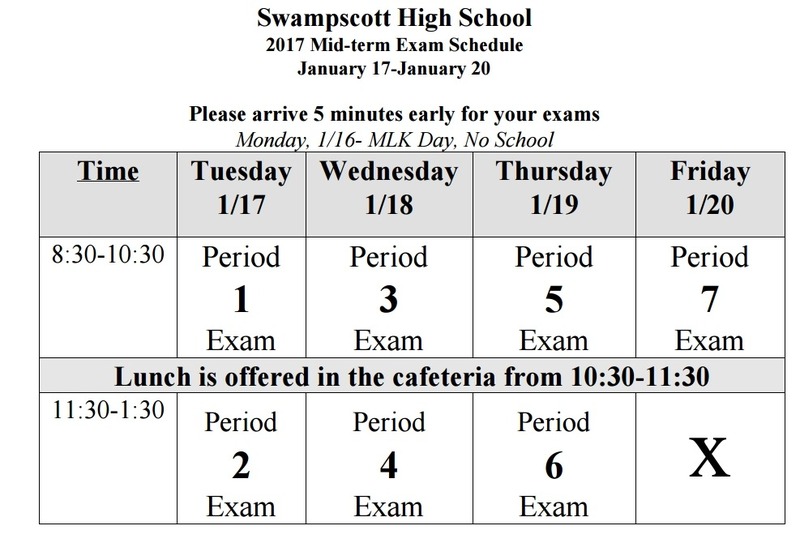 Students only come to SHS for their specific exams. Therefore, they have ample time to study, prepare, and practice mindfulness. We had 55 students participate in the District event. Of the 55 students, 23 qualified for the State competition and 7 of those 23 came in first place in their categories. We also had 10 students place 5th which puts them in a position to be bumped up into the State competition if anybody in the top 4 is unable to attend. As a comparison, we had 8 students qualify for States last year out of 42, so we had significantly improved results at this year's competition! Since December, when Swampscott successfully hosted the science meet with 21 participating schools (2nd place in Gene Editing, overall 12th place out of 21). The team just made the Top 10 (placing 10th out of 21) on Tuesday at Masconomet. Four SHS students have been accepted to participate in this week’s MMEA Northeastern District Festival Chorus. The concert will be held this Saturday, January 14th at UMass Lowell and it’s sure to be a wonderful event. The students are Joshua Badal-Rodrigues, Nate Ryan, Tenley Seidel and Charlotte Westhoven. Shout out to Mr. Pearse’s chorus program! The Swampscott Boys Indoor Track and Field squad improved to 4-0 in the NEC with a 59-27 win over Salem. The Big Blue were lead by the following 1st place finishers: Jack Dennehy in the 1 Mile (5:05.4), Connor Lynch in the 300m (41.9), Dave Quill in the shot put (41’11.5”) Oliver Daniels-Koch in the 2 mile (11:39.2) and Isaiah Bascon in the high jump (5’8”). Upcoming meets include Division 4 Relays in Boston and an NEC match with Marblehead on 1/19/17. After the first week of racing The Girls JV race team Moves to 4-0! After the first week of racing The Boys JV race team Moves to 1-2! The girls co-op played Oakmont to a 3-3 tie over the weekend. Our Big Blue girls worked together for the teams second goal when Syd Cresta scored off of a pass from Caroline Kinne. Sarah Ryan made 8 saves in the game. The team skated on Tuesday night at Fenway Park. They assisted the Boston Pride players in conducting a girls youth hockey clinic. Denna Lang took to the ice on Tuesday night for the ceremonial puck drop before the Women’s BC vs Harvard game. All proceeds from Tuesday’s game went to the Denna Laing Fund. The team travels to Winthrop Saturday afternoon for a 1:30 puck drop. Lots of best times made this week vs. two tough teams. Senior Rachael Rooklin made a best time in the 50 Freestyle with a time of 1:40.23. She has dropped over 14 seconds this season off last years best time. Peabody 46, Swampscott 38. A tough start made it difficult for the Big Blue to come back and a fourth quarter rally proved not to be enough. Nikki Rosa led the Big Blue with 12 points and Olivia Matela had 11, including three 3 pointers. Swampscott 56, Revere 65. Hard fought battle against the Boston Globe ranked 5th team in the state. Even though it was a loss, it proved we can play with anybody. The girls never quit and showed what they are capable of. Jaymie Caponigro had 14 points, Nikki Rosa had 12, Hannah Leahy had 11 and Olivia Matela had 9, including another three 3's.